THE KITCHEN: The latest archaeological news at Monticello came late last year when a dig in the South Pavilion cellar discovered portions of several stoves used by Jefferson’s enslaved French-trained chef James Hemings. An excellent, well-illustrated article in Live Science (http://bit.ly/MontKitchen) reveals what happened when researchers started digging in a space in the cellar that had been used as a visitors’ bathroom for more than fifty years before the Thomas Jefferson Foundation decided to restore the cellar to what it was in Jefferson’s time. The article notes that the archaeological team also found a trove of other artifacts, including pottery and glass bottle fragments, animal bones, and toothbrushes, along with the original brick kitchen floor, and pieces of the fireplace and four stew stoves. The photo above, from the Thomas Jefferson Foundation, shows the recreated stew stoves. James Hemings, who was born in 1765, was among the scores of slaves owned by Thomas Jefferson’s father-in-law John Wayles. James’ mother was Elizabeth (Betty) Hemings. It’s all but certain that John Wayles was his father—as well as the father of all of James Hemings’ five full siblings, including his younger sister Sally. That meant that those Hemings siblings also were Thomas Jefferson’s wife Martha’s half brothers and sisters. Jefferson took James (and Sally) Hemings to Paris in August of 1784, when he served as U.S. Minister (Ambassador) to France, which is where James learned to cook. He was freed by Jefferson in 1796, seven years after they returned from France. I do not mention James Hemings in Saving Monticello, as he had left Monticello well before the story I tell begins—and he died in 1801. Nor do I mention his famed younger sister Sally Hemings for the same reason. The only time the name “Hemings” comes up in my book is when I discuss Thomas Jefferson’s death in 1826 and his will. In it, Jefferson left his walking staff to James Madison. He gave watches to each of his grandchildren, and donated his books to the University of Virginia—although they later were sold, instead, to raise cash. A codicil in the will granted freedom to five of Monticello’s enslaved people who had learned trades, all of whom were members of the Hemings family: Joe Fossett, Burwell Culbert, and John, Madison and Eston Hemings. Burwell Culbert, who was Jefferson’s butler and main household servant, also received $300. All five newly free men were also given houses. 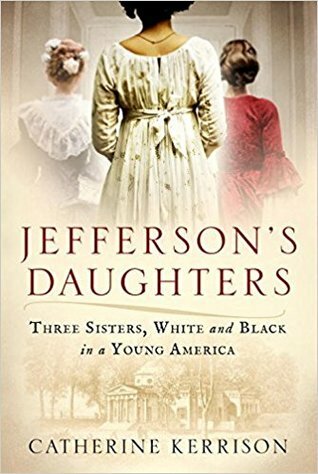 HIS THREE DAUGHTERS: Another member of the Hemings family is one of the three women profiled in the just-published book, Jefferson’s Daughters: Three Sisters, White and Black in a Young America (Ballantine Books, 425 pp. $28, by Katherine Kerrison, a Villanova University U.S. History Professor. The book is a combined biography of Thomas and Martha Jefferson’s two daughters, Martha, whom Jefferson called “Patsy” (1772-1836), and Maria (1778-1804), known as “Polly”—along with Kerrison’s reconstruction of the life of Harriet Hemings, who was born in 1801, the daughter of Sally Hemings and Thomas Jefferson. The Thomas Jefferson Foundation and most historians believe that Jefferson and Sally Hemings had a total of six children following the death of his wife Martha in 1782. Harriet was the eldest. Harriet Hemings was given her freedom at age 21. She left Monticello, and moved to Washington, D.C. in 1822, four years before Jefferson’s death. She never saw her mother or father after that. According to Kerrison’s book, Harriet Hemings (who was seven-eighths white) married a white man in Washington and had several children. She and her children lived as white people.